In a few days my dear grandmother is turning 91 years old. At almost 91 my grandmother has more energy than I do and a social schedule that would make an 18 year old jealous. This wonderful woman is sweet, kind, funny , caring and so generous. In other words, the perfect grandmother (and great-grandmother!). In the past I’ve mentioned that during my childhood I spent many days in her cozy little kitchen learning how to bake. It’s definitely there that my passion for baking was ignited. And over the years I’ve been slowly teaching my own kids the art of making the perfect biscuit or bobo ball just as my grandmother taught me. Today I made up a batch of my grandmother’s Brown Sugar Shortbreads. These cookies are so buttery and rich and make your house smell like absolute heaven when they’re baking in the oven. 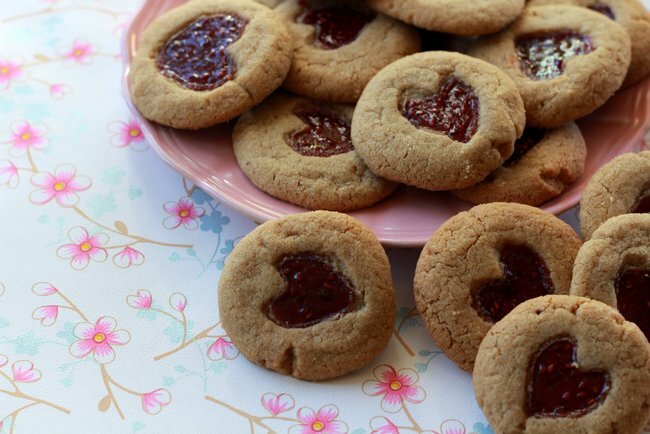 Usually you should make a thumbprint in the balls of dough and fill it up with jam before baking but I thought for the occasion of my grandmother’s 91st I’d make little jam filled hearts in the middle. And they turned out perfectly. 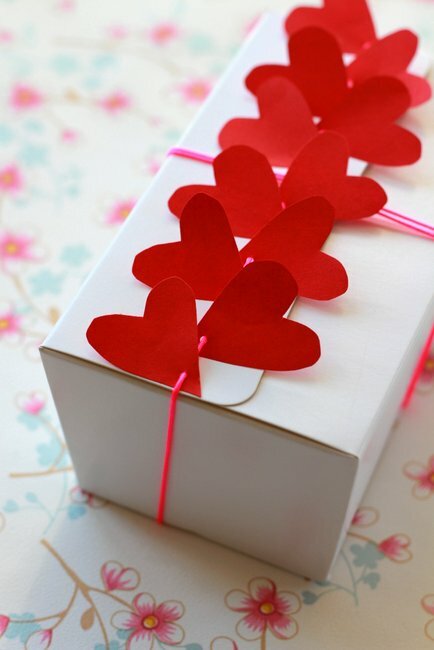 I think I’ll be making these by the dozen to give out on Valentine’s Day as well. Believe me, cookies like these will make people feel loved. 1. Cream butter and brown sugar. 2. Add egg yolk and mix to combine. 3. Add flour and salt and mix until becomes dense dough. 4. Roll into balls and place on cookie sheet. Flatten slightly then either make an indent with thumb (or a carrot heart like me!). Fill hole with favorite jam. 5. Bake in 350 (180) oven for 10-15 minutes. 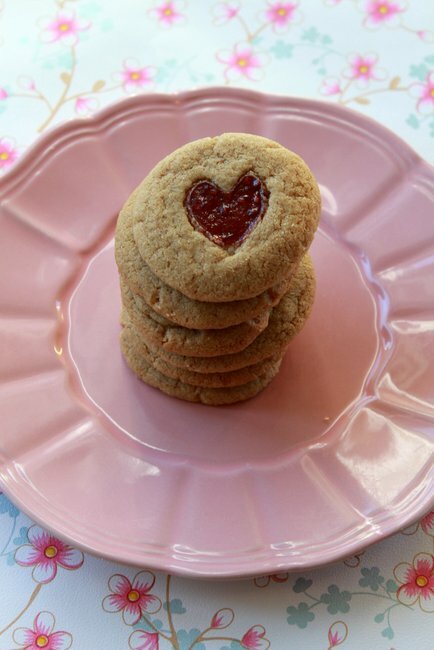 As you read above in the recipe, I carved out a heart in a carrot to use as my “stamp” for the middle of the cookie. 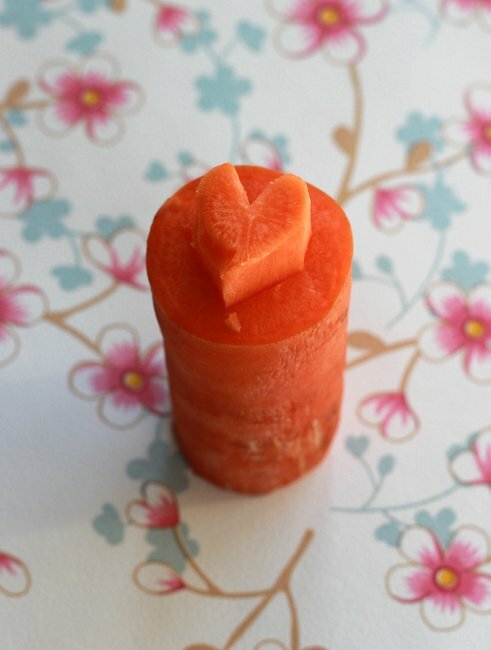 My kids thought I was nuts but it actually worked out perfectly in the end (and let me tell you how hard it is to carve a carrot with a half-healed broken wrist!). We’ll be enjoying these this week-end and sending loving birthday thoughts to my grandmother in Canada. 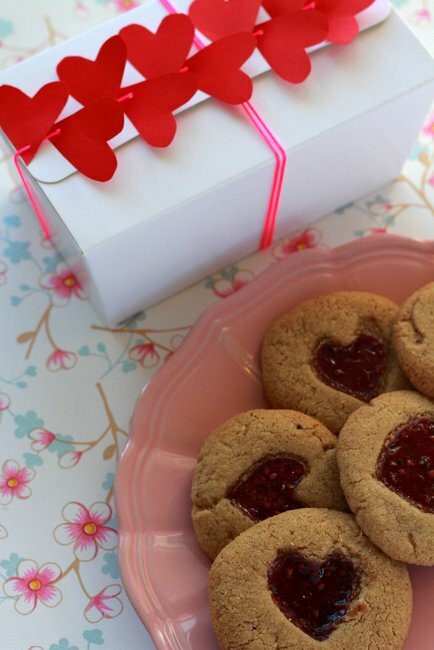 Wouldn’t a sweet little decorated box filled with these delicious cookies make the perfect Valentine’s Day gift? happy birthday to your grandmother! she sounds wonderful and these cookies look amazing! Thank you! And these cookies really are so delicious. Definitely worth trying! I will definitely try this out. They sound delicious and seam to be easy to do. Will let you know how they turned out. They lasted about 5 hours in our house! Hope yours turn out. Oh, this is a sweet, yummy idea! Have to try this out! Come! It would be great to see you. can be. An annual gas safety check could save lives.